Jianping Yao (M'99-SM'01-F'12) received the Ph.D. degree in electrical engineering from the Université de Toulon, Toulon, France, in December 1997. He joined the School of Electrical Engineering and Computer Science, University of Ottawa, Ottawa, Ontario, Canada, as an Assistant Professor in 2001, where he became an Associate Professor in 2003, and a Full Professor in 2006. He was appointed University Research Chair in Microwave Photonics in 2007. From July 2007 to June 2010, he was the Director of the Ottawa-Carleton Institute for Electrical and Computer Engineering. Prior to joining the University of Ottawa, he was an Assistant Professor in the School of Electrical and Electronic Engineering, Nanyang Technological University, Singapore, from 1999 to 2011. Professor Yao is a principal investigator of more than 20 projects, including five strategic grant projects funded by the Natural Sciences and Engineering Research Council of Canada. He has published more than 510 papers (H-index: 55), including more than 310 papers in peer-reviewed journals and 170 papers in conference proceedings. 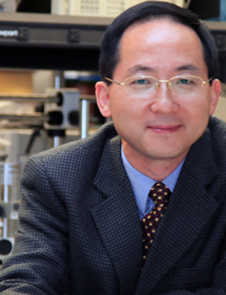 Dr. Yao is a Fellow of IEEE, the Optical Society of America and the Canadian Academy of Engineering. His research interests focus on microwave photonics, which includes photonic processing of microwave signals, photonic generation of microwave, millimeter-wave and terahertz, radio over fibre, ultrawideband over fiber, and photonic generation of microwave arbitrary waveforms. His research also covers fiber optics and biophotonics, which includes fiber lasers, fiber and waveguide Bragg gratings, fiber-optic sensors, microfluidics, optical coherence tomography, and Fourier-transform spectroscopy. Dr. Yao is currently an Associate Editor of the International Journal of Microwave and Optical Technology. He is on the Editorial Board of the IEEE Transactions on Microwave Theory and Techniques. He is a Chair of numerous international conferences, symposia, and workshops, including the Vice Technical Program Committee (TPC) Chair of the IEEE Microwave Photonics Conference in 2007, the TPC Co-Chair of the Asia-Pacific Microwave Photonics Conference in 2009 and 2010, the TPC Chair of the high-speed and broadband wireless technologies subcommittee of the IEEE Radio Wireless Symposium in 2009-2012, the TPC Chair of the microwave photonics subcommittee of the IEEE Photonics Society Annual Meeting in 2009, the TPC Chair of the IEEE Microwave Photonics Conference in 2010, and the General Co-Chair of the IEEE Microwave Photonics Conference in 2011. He is also a committee member of numerous international conferences. Professor Yao received the 2005 International Creative Research Award at the University of Ottawa. He was the recipient of the 2007 George S. Glinski Award for Excellence in Research and the Natural Sciences and Engineering Research Council of Canada Discovery Accelerator Supplements Award in 2008. Professor Yao is a registered Professional Engineer of Ontario. He is a Fellow of IEEE, a Fellow of the Optical Society of America (OSA), and a Fellow of the Canadian Academy of Engineering (CAE).